One of the core themes of Colossal Warfare is Goku's Lineage cards! With the new swap mechanic and a plethoria of Goku's Lineage cards, we can expect some unique game play from the yellow cards. So lets take a look at our Top 5 Yellow cards. Ox-King Dad at Heart is a nicely designed card that gives many low drop cards the protection that they need. 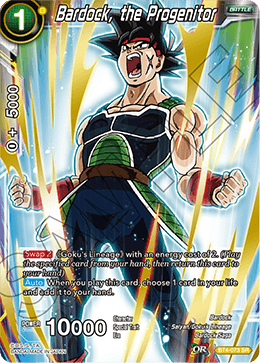 Playing a bunch of 1 or 2 drops would result in Kale or Masked Saiyan wiping them all out, but with Ox-King you no longer have to worry about that. We also love how balanced he is by not giving him self barrier, but if you bring out two of these big boys out, then you get Barrier on both and maximize your protection. Ox-King is perfect in many X/Yellow decks that utilize low drop cards, perhaps mostly anticipated by U11 Jiren decks. There is so many power swap cards that it is hard to keep track. 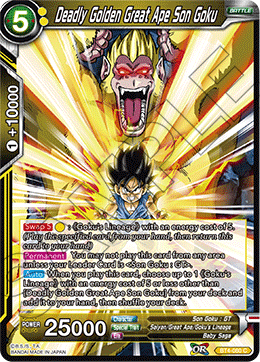 However one card that stands out is Deadly Golden Great Ape Son Goku. Yes he does require a specific leader, but this card is a key part of what will make the leader succeed. More so than his ability to search for a card, Deadly Ape is great because of his ability to Swap into a 5 cost for only 1 energy. That means, he can swap into himself! The reason why this is great is because when he swaps into him self, you get to use his search ability again which can be used to grab the Pan Goku's Lineage Super Combo! For every one yellow energy you spend, you get a 25k attacker and a +1 from a search. Imagine doing this over 3 energy. We highly recommend testing out a SSJ4 Goku Leader with this card and playing the Goku's Lineage Engine. Successor of Hope is one of those super simple cards that see a ton of play. The ability to search your deck for a Goku's Lineage card less than 5, means you can search for all your critical low drop swap cards for 0 energy. Whenever you mulligan on your first turn, you can keep a Successer of Hope to ensure you get what you need. Whether it is a Bardock, or a Pan Super Combo, Successor gives options for the player. I know this card is not part of Colossal Warfare, but its part of the package and too good not to mention. 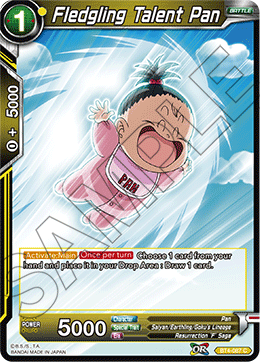 As soon as Son Goten comes out you can expect many different playable decks coming out. His ability to add a card from the top 3 cards is unlike anything we have seen. It is not just battle cards but extra cards as well. This means everytime Goten attacks, you extend your hand by 3 posssible cards. 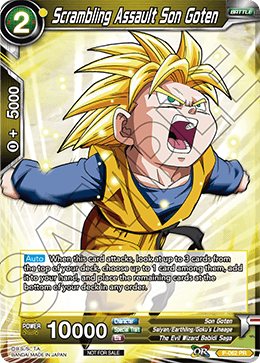 Initially Son Goten will be used in aggro decks where he excels for his ability to find Unyielding Trunks and Senzu Bean. Son Goten will be released August 1st as a Budokai Card Club promo, make sure to attend your locals to pick them up! 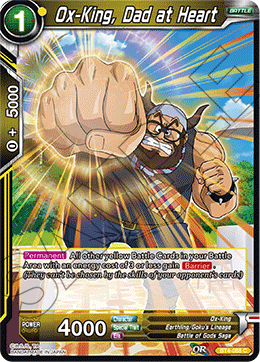 As the firt 1-Drop Super Rare, Goku's Papa makes the list for our best Yellow Card this set. 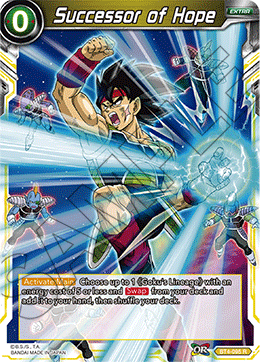 Bardock also has a simple effect, but its applications will be used in many decks. When Bardock enters play, the player takes a life which means the player gets closer to awakening. In addition to getting closer to being Awakened, Bardock is a target for Bardock, Will of Iron to evolve into. The main cause on why Bardock tops our list is because of his Swap into a 2 drop for free. We all know cheating energy is powerful and with Bardock you can bring out the Son Goten we mentioned earlier, a turn sooner and a energy cheaper. If you have no targets to swap for Bardock, no worries, just swap him back to your hand and play him again next turn to get closer to awakening!